Lewis Hamilton won round one of the Monaco Grand Prix weekend by clocking the quickest lap in Free Practice 1 in his Mercedes. Sebastian Vettel fought back and ended up second, 0.196 of a second slower in his Ferrari. Hamilton's time of 1:13.425 was the fastest lap ever around the current Monaco track configuration. The ambient temperature at the start of the 90-minute session was 68 degrees Fahrenheit (20 degrees Centigrade) and the track temperature was 81 degrees Fahrenheit (27 degrees Centigrade). The lineup for the weekend was: Mercedes ‘‚ ‚ ‚ Lewis Hamilton and Valtteri Bottas; Red Bull TAG Heuer ‘‚ ‚ ‚ Daniel Ricciardo and Max Verstappen; Ferrari ‘‚ ‚ ‚ Sebastian Vettel and Kimi Raikkonen; Force India Mercedes ‘‚ ‚ ‚ Sergio Perez and Esteban Ocon; Williams Mercedes ‘‚ ‚ ‚ Felipe Massa and Lance Stroll; McLaren Honda ‘‚ ‚ ‚Jenson Button and Stoffel Vandoorne; Renault ‘‚ ‚ ‚ Nico Hulkenberg and Jolyon Palmer; Toro Rosso Renault ‘‚ ‚ ‚ Daniil Kvyat and Carlos Sainz; Haas Ferrari ‘‚ ‚ ‚ Romain Grosjean and Kevin Magnussen; Sauber Ferrari ‘‚ ‚ ‚ Marcus Ericsson and Pascal Wehrlein. Button had come out of his sabbatical to drive the McLaren and replace Fernando Alonso who is off competing in the Indy 500. "I'm very relaxed, very excited, actually," Button said. "It's interesting coming back for one grand prix. It being Monaco it's very special. I've won here before, I've lived here for 17 years, and I've had some really good experiences here. It's exciting. But I don't feel any pressure - none at all. "I will obviously get in the car and I will do the best job I can, that's what I'm here to do and everything I do in life is the same: you want to be competitive, you want to get the best out of yourself and you want to get the best out of the equipment and the team that you are working with. That hasn't changed." Sainz and Hulkenberg were the first out on the 19-turn 2.073-mile [3.337-km] Monaco street circuit. The Pirelli compounds for the weekend were the soft, super soft and ultra soft. Pole here last year was a 1:13.662 set by Ricciardo. Bottas, quickest in the first 20 minutes of FP1 this year, clocked a 1:15.111 on the super soft slicks. Then Ricciardo beat that with a 1:14.884 on the ultra soft tires. Vettel used the ultras to get down to a 1:14.289. Right at the 40-minute break, Hamilton turned a 1:14.355 on the ultras. The top 10 were: Hamilton, Vettel, Perez, Kvyat, Ricciardo, Massa, Sainz, Raikkonen, Bottas and Verstappen. Button 18th. He was using the soft Pirellis, going for laps and not for lap times. Soon the Mercs were doing ultra runs, and Bottas went fastest at 1:13.828. 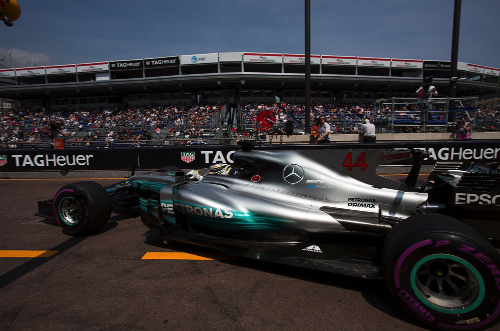 Hamilton responded with a 1:13.429, which beat last year's pole time of 1:13.662. Vettel had another go on the ultras but only got down to a 1:14.060. Then Ricciardo beat his former teammate by clocking a 1:13.950. Vettel came back with a 1:13.928 and then a 1:13.621. "We've got the top four cars in covered by half a second and the top six on the ultra soft," Pirelli tweeted with 25 minutes remaining in the session. Make that five as Verstappen's 1:13.878 followed by a 1:13.816 and then a 1:13.781 and a 1:13.771 put him in that group as well. Button was now doing ultra soft runs and moved up to 14th. Hamilton remained unbeaten in round 1. He had lowered his time to a 1:13.425 ‘‚ ‚ ‚ the fastest lap ever around this Monaco track. He headed the top 10 followed by Vettel, Verstappen, Bottas, Ricciardo, Kvyat, Raikkonen, Perez, Sainz and Ocon. All set their times on the ultra soft Pirellis but Kvyat and Sainz who used the super soft tires.